This article is about the Chinese tile-based game. For the card-matching solitaire game, see Mahjong solitaire. For other uses, see Mahjong (disambiguation). Mahjong (/mɑːˈdʒɒŋ/ mah-JONG, Mandarin: [mǎ.tɕjâŋ]) is a tile-based game that was developed in China during the Qing dynasty and has spread throughout the world since the early 20th century. It is commonly played by four players (with some three-player variations found in Japan, South Korea and Southeast Asia). The game and its regional variants are widely played throughout Eastern and South Eastern Asia and have become popular in Western countries too. The game has also been adapted into a widespread online entertainment. Similar to the Western card game rummy, Mahjong is a game of skill, strategy, and calculation and involves a degree of chance. The game is played with a set of 144 tiles based on Chinese characters and symbols, although some regional variations may omit some tiles or add unique tiles. In most variations, each player begins by receiving 13 tiles. In turn players draw and discard tiles until they complete a legal hand using the 14th drawn tile to form 4 melds (or sets) and a pair (eye). A player can also win with a small class of special hands. There are fairly standard rules about how a piece is drawn, how a piece is robbed from another player, the use of simples (numbered tiles) and honors (winds and dragons), the kinds of melds allowed, how to deal the tiles and the order of play. Despite these similarities, there are many regional variations to the rules including rather different scoring systems, criteria for legal winning hands and even private table rules which distinguish some variations as notably different styles of mahjong. In Chinese, the game was originally called 麻雀 (pinyin: máquè)—meaning sparrow— which is still used in some southern dialects. It is said that the clacking of tiles during shuffling resembles the chattering of sparrows. It has also been suggested that the name came from an evolution of an earlier card game called Ma-Tiao which mahjong is supposedly roughly adapted from. 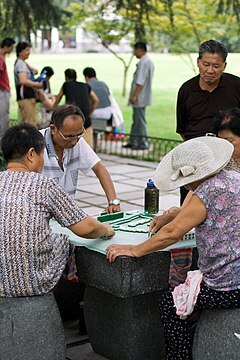 Most Mandarin-speaking Chinese now call the game 麻将 (májiàng). There are many highly varied versions of mahjong both in rules and tiles used. "Old Hong Kong Mahjong" uses the same basic features and rules as the majority of the different variations of the game. This form of Mahjong uses all of the tiles of the most commonly available sets, includes no exotic complex rules, and has a relatively small set of scoring sets/hands with a simple scoring system. For these reasons Hong Kong mahjong is a suitable variation for the introduction of game rules and play and is the focus of this article. Old Hong Kong Mahjong is played with a standard set of Mahjong tiles (though cards may be used). Sets often include counters (to keep score), dice (to decide how to deal), and a marker to show who the dealer is and which round is being played. Some sets include racks to hold the tiles, especially if they are larger or smaller than standard tiles or have an odd shape. 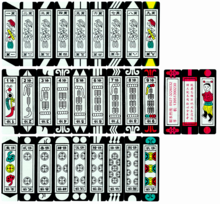 A set of Mahjong tiles usually has at least 136 tiles (most commonly 144); however, sets originating from the United States or Southeast Asia will probably have more. Mahjong tiles are split into 3 categories: Suits, Honors, and Bonuses. There are 3 suits of simples and in each suit the tiles are numbered from 1 to 9. The suits are bamboos, dots, and characters. There are 4 identical copies of each simples tile totaling 108 simples tiles. The bamboo suit is also known as "sticks" or "bams" suit; the first tile usually has a bird (traditionally, a peacock or sparrow) instead of a single bamboo. The dots suit is also known as the "wheels", "balls", or "coins" suit. The characters suit is also known as the "cracks" or "numbers" suit since the top character is the Chinese number, and the bottom character is the Chinese number "ten thousand". There are two different sets of Honors tiles: Winds and Dragons. The Winds are East, South, West, and North. In Mahjong, East (not North) is the beginning. The Dragons are Red, Green, and White. The white dragon has a blue or black frame on the face of the piece or in some sets is entirely blank. These tiles have no numerical sequence like the simples (for example the bamboo pieces number 1 to 9). Like the simples, there are four identical copies of each Honors tile, for a total of 28 Honors tiles. There are two sets of Bonus tiles: Flowers and Seasons. The flower and season tiles play a unique role in the mechanics of the game. When drawn, the Bonus tile is not added into a player's hand but are instead set aside and kept near the player's other tiles for scoring purposes should they win the hand, and an extra tile is drawn in replacement of the Bonus tile. In addition, unlike the Simple and Honors tiles, there is only a single tile of each Bonus tile, so there are a total of four flower and four season tiles in the set. The tiles have a different artistic rendering of a specific type of flower or season. It is not necessary to know the names or the Chinese characters of each bonus tile, only the number, as this is associated with a specific direction, and the player receives bonus points when the Bonus tile matches the seat direction. There is no relation between the bonus tile "bamboo" flower and the bamboo suit of simple tiles (ex. 2 bamboo). In traditional Chinese culture, the Four Gentlemen are the plum (winter), orchid (spring), bamboo (summer), and chrysanthemum (autumn) which are regarded as the representative plants of those seasons. The dealer is chosen by various means. For example, each player throws dice with the highest count taking the dealer position, second highest taking south etc. Or one player may place one tile of each wind face down and shuffle them. Each player randomly select one of these tiles and these tiles dictate their wind position. 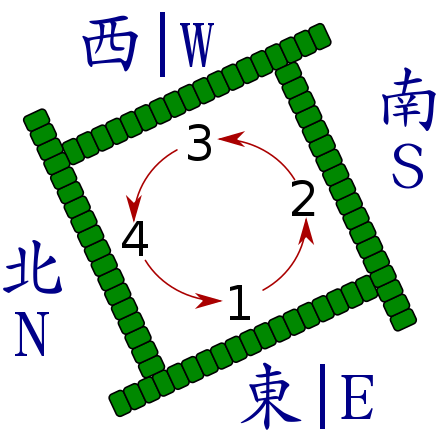 Each player sits down at their respective position (called the wind position) at the table in positions of an inverted compass: East is dealer, the right of the dealer is South, across is West, and the left is North. The order of play is traditionally counter-clockwise. A match consists of four rounds, each representing a "prevailing wind," starting with East. Once the first round is completed, a second round begins with South as the prevailing wind, and so on. Wind position is significant in that it affects the scoring of the game. A Mahjong set with Winds in play will usually include a separate prevailing wind marker (typically a die marked with the Wind characters in a holder). Whenever a player in the East position (dealer) wins a hand, or if there is no winner (a draw or "goulash hand"), an extra hand is played with the same seating positions and prevailing wind as in the previous hand. This means that a match may potentially have no limit to the number of hands played (though some players will set a limit of three consecutive hands allowed with the same seat positions and prevailing wind). All tiles are placed face down on the table and are shuffled. By convention all players should participate in shuffling using both hands moving the pieces around the table rigorously and loudly for a lengthy period. Tiles may get flipped up during this process and players should flip them facing down as soon as possible to avoid identifying the location of the revealed tiles. Each player then stacks a row of 18 tiles, two tiles high in front of them (for a total of 36 tiles). Players then push each side of their stack together to form a square wall. Regular players usually place their stacks in a slightly diagonal position (about 20 to 30 degrees anti-clockwise); the right end of their stack is pushed slightly further in to the centre of the table to meet almost the middle of the stack of the player on the right. This creates a smaller square wall the length of about half of each stack, with walls extended away from each corner of the square. The diagonally positioned stacks and a smaller square creates a bigger space for players' tiles and also makes an ergonomic position for drawing tiles from the stack. The dealer throws three dice in the square wall and sums up the total. Counting anti-clockwise so that the dealer is 1 (or 5, 9, 13, 17), so that south (player to the right) is 2 (or 6, 10, 14, 18), etc., a player's quarter of the wall is chosen. Some house rules may use only two dice but have double throws to increase randomness. In the case of double throws, the player of the chosen wall makes the second throw. Using the same total on the dice (or the total of the two throws), the player whose wall is chosen then counts the stacks of tiles from right to left. (For double throws, the count may extend to the left side player's stack.) This determines the location where the 'deck' of tiles is cut. Starting from the left of the stacks counted, the dealer draws four tiles for himself, and players in anti-clockwise order draw blocks of four tiles until all players have 12 tiles, so that the stacks decrease clockwise. Each player then draws one last tile to make a 13-tile hand. Dealing does not have to be strictly this way and may be done quite differently based on house rules. Tiles may flip over when being dealt and players should agree in advance on how to deal with the problem. Solutions include having the dealer penalised points, shuffling the turned over piece back into the wall somehow, allowing the player who the tiles were dealt to take the piece or not (meaning the dealer must take it as his/her 14th piece) or other house rules. Each player now sets aside any Flowers or Seasons they may have drawn and takes turns to draw replacement piece(s) from the wall in the anti-clockwise direction. If a player gets any Flowers or Seasons tiles in the replacement draw, the players must wait for the next turn to draw replacement tiles. While drawing the 13th piece to complete the initial hand, the dealer (E) will typically also draw a 14th piece (both highlighted in blue) to initiate the game. The dealer draws a piece from the wall in clockwise direction, adding it to their hand. Typically, this draw is performed during the initial deal to speed up play. If this does not complete a legal hand, the dealer then discards a piece (throwing it into the middle of the wall with no particular order in mind). Each player in turn, in counterclockwise direction, draws a tile from the wall; as long as the tile drawn is not one of the Bonus tiles, the player proceeds to discard a tile (either the tile just drawn, or a tile in the hand) to maintain a hand of 13. The discarded tile is thrown into the centre and, if desired, the player announces out loud what the piece is. The other players have an opportunity to seize the discarded tile; if no one takes it, the turn continues to the next player. Play continues this way until one player has a legal winning hand and calls out "Mahjong" while revealing their hand. During play, each player's hand should always be 13 tiles (meaning in each turn a tile must be picked up and another discarded). The count of 13 tiles do not include any Bonus tiles (Flowers and Seasons), which are set to the side, nor does it include the fourth added piece of a Kong. If a player is seen to have fewer or more than 13 tiles in their hand outside of their turn they are penalised. A winning hand consists of 14 tiles. Since players always have 13 tiles in their hand during play, they must win by either drawing a piece from the wall that completes a 14-tile hand ("winning from the wall") or claiming a discard from another player which completes a 14-tile hand ("winning by discard"). The winning hand is made of four melds (a specific pattern of three pieces) and the eyes (a pair of identical pieces). The exceptions to this rule are the special hands listed below. Most players play with a table minimum, meaning a winning hand must score a minimum number of points (which can be seen in the scoring section). In Hong Kong Mahjong the most common point set is three but can be higher or lower depending on house rules. Melds are groups of tiles within the player's hand, consisting of either a Pong (three identical tiles), a Kong (four identical tiles), a Chow (three Simple tiles all of the same suit, in numerical sequence), or Eyes (two identical tiles needed in a winning hand). Melds may be formed by drawing a tile from the wall, or by seizing another player's discard. There are rules governing which player has priority for a discard, and whether the meld should be exposed (displayed to all players) or remain concealed, depending on the manner in which the meld is formed. You may form a Pong with any Simple or Honours tile. Bonus tiles (Flowers or Seasons) cannot be used to form a Pong because they are set aside and there are not three identical bonus tiles in the set. The tiles must be identical (you cannot mix suits). A Pong may either be concealed (formed by drawing tiles) or exposed (formed by seizing another player's discard). Consider a Kong the same as a Pong with an additional tile to make a complete set of four. There are three ways to form a Kong. Concealed Kong - If a player holds three matching tiles (concealed Pong) and upon drawing a tile completes a set of four they may declare a Kong. They do so by revealing the meld and placing two pieces in the middle face up and two pieces on the ends face down. Exposed Kong - If a player can use a discarded tile to complete three matching tiles (concealed Pong) in their hand, he can take the piece and reveal an "exposed kong" or "melded kong". The player reveals his three pieces face up and places the stolen discard on top of the middle tile, or face down next to the three other face up pieces. Exposed Kong from Exposed Pong - If a player has already has a melded Pong and then later in the game draws the fourth piece from the wall, he may announce (then or later in the game) a Kong by placing the fourth tile on top of the middle piece of the melded Pong, or all four tiles placed face up in a row. If a Pong has been melded a player cannot steal the 4th piece if another player discards it, it must be drawn. Whenever a Kong is formed, that player must draw an extra tile from the end of the wall and then discard a tile. The fourth piece of a Kong is not considered as one of the 13 tiles a player must always have in their hand. A Kong may not be formed from Bonus tiles (Flowers/Seasons), since the set does not include four identical tiles. Kongs are worth collecting to score more points and deprive opponents of the opportunity to obtain specific tiles. The meld must be in absolute numerical sequence and all in the same suit. Players cannot skip numbers or meld from the 8 or 9 to 1 or 2. Honours tiles cannot be used to make Chows because they have no numerical value, and Bonus tiles (Flowers and Seasons) also cannot be used to make a Chow. A player can steal a discard to form a Chow only from the player whose turn was immediately before theirs; however, a player forming a Chow from a seized piece has the lowest priority for that tile. Any other player that needs that tile to make a Pong, make a Kong, or to win may seize that piece instead. Like the Pong, the Chow is either concealed (formed by drawing tiles) or exposed (formed by seizing the prior player's discard). Eyes (also known as a pair) are two identical tiles which are an essential part of a legal winning hand. A piece cannot be stolen (melded) to form a pair of eyes unless the player simultaneously completes a legal winning hand. Whenever a player draws a flower or season, it is announced and then placed to the side (it is not considered a part of the 13-tile hand, but in the event that player wins, he will earn a bonus point for them) and the last tile of the wall is drawn as a replacement tile so that the player has the 14 pieces needed before their discard. This may happen successively in a player's turn. When a player discards a tile, other players may steal the tile to complete a meld. Stealing tiles has both advantages (quickly forming a winning hand and scoring extra points) and disadvantages (being forced to reveal part of one's hand to other players and not being able to change the meld once declared). When a meld (Pong, Kong or Chow) is declared through a discard, the player must state the type of meld to be declared and expose the meld by place the three (or four) tiles face up. The player must then discard a tile, and play continues to the right. If the player who melds a discard is not directly after the discarder (in order of play), one or two players will essentially miss their turn as play continues anti-clockwise from the player who declared the meld. If multiple players call for a discarded tile, priority for the discard depends on the declared action of the player stealing the discard. Highest priority goes to the player who needs the discarded tile to win the hand. A player may take the tile to win the hand from any other player. Next priority goes to the player who declares a Pong or Kong using the discard. A player who calls for a Pong or Kong may take the discard from any other player. Last priority goes to the player who declares a Chow using the discard. Players may only call for a Chow from the discard of the player immediately prior to them, unless the tile is the final one required to complete the hand. Going Mahjong is the act of declaring a winning hand, either by stealing a discard or by drawing a winning tile. If at any point in the game a player can use another player's discard to complete a legal hand (and with the agreed minimum points), they yell out 'Mahjong! ', take the discard and reveal their winning hand. This ends the hand, and scoring commences. If more than one player can use a discard to go mahjong (win the hand) there are two ways to resolve the issue depending on agreed table rules: Either the players count the points they would win with the discard and the winner is the one with the higher score, or the winner is simply the player closest to the discarder in order of turn. A rarely occurring and high-scoring feature of Hong Kong Mahjong is a move called robbing the Kong. If a player declares a Kong (either by melding it or adding a fourth piece to a Pong to form a Kong or declaring a concealed Kong) but another player can use that piece to complete a hand, the completing player takes priority to go Mahjong (win the hand) and may steal that piece from the player who intended to declare the Kong. By logic, since there are only four identical copies of each Simple and Honours tile in a complete set, if two separate players are looking to form a Pong with that tile, they each have two of the same tile, and no free tiles remain in the wall to make a Pong. Below are two examples of winning hands. A winning hand must consist of four melds (Pongs, Kongs, or Chows) and a pair (eyes) and must also score the agreed table minimum. Most players include table variations in their games, of which some non-standard are included. The hands of seven different pairs and 13 orphans are examples which do not have four melds and the eyes. They are described in more detail below. Calling out Mahjong! without having a complete (legal) hand or without the minimum points is usually penalized depending on table rules. The player may forfeit points to the other players. Another potential penalty is the player who called out the false mahjong must play the rest of the hand with their tiles face up on the table so other players can see them (open hand). If the dealer wins the hand, he will remain the dealer and an extra hand is played in addition to the minimum 16 hands in a match. An extra hand is also played if there is no winner by the time all the tiles in the wall have been drawn. When there is no winner it is known as a "goulash hand". Depending on table rules, the winner of the next game may take an agreed number of points from each player, carrying over the points from the non-winning hand to the winning one. If there are two or three goulash hands in a row then the winner would collect a considerable number of points from each player on top of their scoring hand. Because extra hands may be played every time a dealer wins or if there is a goulash hand, a match of 16 hands can easily become a match of 20 or even much more. As table rules add a large amount flexibility for players, they can choose to disregard the rule of extra hands and pass on the dealership regardless of who wins or if it results in a goulash hand. This puts a maximum estimated limit on the game duration and provides some amount of predictability. Players may agree on table rules if the pace of the game is brisk or leisurely. For brisk games players may agree that a couple seconds after a discard are allowed for a "window of opportunity" before the next player picks up from the wall. Usually it is agreed once the next player has waited the duration of the "window of opportunity" and draws a tile from the wall, the previous discard is lost and cannot be claimed. Old Hong Kong scoring is relatively simple. There is only one winner (or if there is a draw the hand is replayed). The winner must have a legal hand that meets the minimum faan points agreed to in advance (not including any bonus points). Only the winner scores, the other players pay the winner various sums. After each hand ends, the winner counts all of his or her faan points. A concealed meld is one that contains no tiles stolen from another players discard. A concealed hand is one made up of only concealed melds. Many variations distinguish between a concealed hand (winning from the wall) and a semi concealed hand (the last tile is a stolen discard). In most mahjong variations having a concealed hand can be valuable in scoring. Hong Kong mahjong doesn't award concealed melds/hands as generously as others. Concealed hands only the case with a few limit hands or half-limit hands (thirteen orphans, heavenly gates, four concealed pongs) as well as a complete hand (seven pairs) and over several melds (three concealed pongs). A player only scores a bonus faan for Flowers or Seasons if it is their own flower or season (East=1, South=2, West=3 and North=4) or if the player has all four Flowers or all four Seasons (scoring 5 faan in total). The losers pay the winning player points based on several criteria and depending on whether the game is for fun or for money. How points are reckoned is agreed by players beforehand. For example, they can keep a tally, exchange chips or pay one another with money. The faan value of a hand is converted into base points which are then used to calculate the points the losers pay the winner. The table is progressive, doubling the number of base points when reaching a certain faan point target. The following is the Old Hong Kong simplified table, for other tables see Hong Kong Mahjong scoring rules. If east player is a losing player he pays double the points to the winner. If two of these criteria apply to any player, he must double and then redouble the points owed to the winner. In Hong Kong Mahjong there are a series of "limit hands". These are exceptional hands, difficult to obtain and are very valuable in point scoring. As many table rules put a limit on the amount of points a winners hand can score, full limit hands score that maximum. Table rules dictate if these rare and special hands are allowed, which ones, and the limit for scoring. A common scoring limit is 64 points, which is the highest base points doubled twice. A winner receives the scoring limit from each player without any doubling. Some limit hands by necessity must be completely concealed (not discards used) or semi-concealed (the only discard used is the one needed to go mahjong). This includes the 13 orphans, 4 concealed pongs, heavenly hand and earthly hand. It is usually expected that the heavenly gates hand be concealed or semi-concealed. As for the dragon limit hands and the great winds, table rules dictate if the hand must be concealed or not. Some table rules claim that a semi-concealed hand (winning from a discard) scores a half-limit. Some groups also play with the "great Flowers" rule. If a player picks up all four Flowers and all four Seasons during their hand, they instantly win the hand and receive the maximum points from all of the players. This is exceptionally rare. In all the hands that require pongs, each pong can be replaced by the corresponding kong. The dealer draws a winning hand at the beginning of the game. A player completes a winning hand with the dealer's first discard and in most variants, provided the dealer does not draw a kong. Player has only 1s and 9s in the winning hand. Player has 1112345678999 of any simple suit; any one extra piece of the same suit suffices to win. This hand always has 4 melds and the eyes. In the example below, there are two Pongs (111 and 999), two Chows (234 and 678) and the extra 5 forms the Eyes. Chinese classical Mahjong is the oldest surviving variety of Mahjong and was the version introduced to America in the 1920s under various names. It has a small, loyal following in the West, although few play it in Asia. All players score and it is possible to score higher than the winner. Hong Kong Mahjong or Cantonese Mahjong is a more common form of Mahjong, differing in minor scoring details from the Chinese Classical variety. It does not allow multiple players to win from a single discard. Competition Mahjong is an international standard founded by All-China Sports Federation in July 1998 that some Mahjong societies have adopted for competition play and in some cases for all play. Sichuan Mahjong is a growing variety, particularly in southern China, disallowing chi melds, and using only the suited tiles. Play continues until a loser is decided or a draw. It can be played very quickly. Wuhan Mahjong is growing rapidly and become popular in southern China. It is different from other parts of China such that it has a tile that can be used as everything called Laizi (赖子), and the player has to have a set of special two tiles, namely two, five, eight, as prerequisite for winning. Another variation has become the new trend, and is called 红中赖子杠. Special tiles need to be discarded. Changsha Mahjong is widely played in Hunan Province. Like Wuhan Mahjong, players need to obtain special Jong consisting of only tiles of two, five or eight. Changsha Mahjong forbids using winds and some special tiles, those tiles are first drawn out from the table when playing. Winners each round get a special drawing session for bonuses, usually doubling the score. Tianjin Mahjong using normally seven jokers, with special scoring such as joker-free, joker-waiting-pair, catch-5, dragon, joker-suited-dragon. Shenyang Mahjong using 13 hands in a game, and Shenyang Mahjong has a really fast speed on playing, which allegedly might be said in some regard to perhaps match the personality of North-east people in China. Also in Shenyang Mahjong, the player must to have Bamboos, Characters, Circles and number one or nine in his hand. In addition, the players have to Pong before they Chow, so there is no chance to win even if some players win at the first time they have their hands in hand. Taiwanese Mahjong is the variety prevalent in Taiwan and involves hands of sixteen tiles (as opposed to the thirteen-tile hands in other versions), features bonuses for dealers and recurring dealerships, and allows multiple players to win from a single discard. Filipino Mahjong, sixteen tile hands. Certain tiles can be wild. Honors are treated as bonuses. Fujian Mahjong, thirteen tile hands. Certain tiles can be wild. No dragons. Winds are treated as bonuses. Shanxi Mahjong, or Lisi (Raise 4; zh:太原立四麻将), the players must win with the first four blocks drawn which are placed separately in front of other. These four blocks cannot be touched until the player has a ready hand. Singaporean-Malaysian Mahjong are two similar variants with much in common with Hong Kong mahjong. Unique elements of Singaporean-Malaysian Mahjong are the use of four animal bonus tiles (cat, mouse, cockerel, and centipede) as well as certain alternatives in the scoring rules, which allow payouts midway through the game if certain conditions (such as a kang) are met. Melds may also be presented in a form different to most other variations. South African Mahjong is a variant of Cantonese Mahjong. It is very similar in terms of game play and follows most of the rules and regulations of Cantonese Mahjong. However, there are some minor differences in scoring, e.g. the limit on the maximum points a hand can be rewarded is three or four fan depending on the house rules. A chicken hand (gai wu) is normally considered a value hand. Depending on the house rules Flowers may also be used to boost scoring. Thai Mahjong has eight specialized jokers with eight extra flowers and eight animals for a total of 168 tiles. Vietnamese Mahjong has the same eight specialized jokers but with only eight different extra flowers for a total of 160 tiles. Modern variant triplicates or quadruplicates the jokers for a total of 176 or 184 tiles. Japanese classical Mahjong is still used in tournaments. It is closer to the Chinese classical scoring system but only the winner scores. Japanese Mahjong is a standardized form of Mahjong in Japan and is also found prevalently in video games. In addition to scoring changes, the rules of rīchi (ready hand) and dora (bonus tiles) are unique highlights of this variant. In addition, tile discards are specifically arranged in front of each player by discard order, to take discarded tiles into account during play. Some rules replace some number 5 tiles with red tiles so that they can eventually get more value. Korean Mahjong is unique in many ways and is an excellent version for three players. One suit is omitted completely (usually the Bamboo set or 2–8 of bamboo) as well as the Seasons. The scoring is simpler and the play is faster. No melded chows are allowed and concealed hands are common. Riichi (much like its Japanese cousin) is an integral part of the game as well. San Hako Riichi Mahjong is a variant of Japanese Mahjong that can be played with either two or three players. American Mahjong is a form of Mahjong standardized by the National Mah Jongg League and the American Mah-Jongg Association. It uses joker tiles, the Charleston, plus melds of five or more tiles, treats bonus tiles as honors, and eschews the Chow and the notion of a standard hand. Legal hands are changed annually. Purists claim that this makes American Mahjong a separate game. In addition, the NMJL and AMJA variations, which have minor scoring differences, are commonly referred to as Mahjongg or mah-jongg (with 2 Gs, often hyphenated). Mah Jongg Card Game by Winning Moves is a card game variant based on the basic Mah Jongg game. Three-player Mahjong (or 3-ka) is a simplified three-person Mahjong that involves hands of 13 tiles (with a total of 84 tiles on the table) and may use jokers depending on the variation. Any rule set can be adapted for three players; however, this is far more common and accepted in Japan, Korea, Malaysia and the Philippines. It usually eliminates one suit entirely, or tiles 2-8 in one suit leaving only the terminals. It needs fewer people to start a game and the turnaround time of a game is short—hence, it is considered a fast game. In some versions there is a jackpot for winning in which whoever accumulates a point of 10 is considered to hit the jackpot or whoever scores three hidden hands first. The Malaysian and Korean versions drop one wind and may include a seat dragon. Interior of an automatic mahjong table. Mahjong tables are square and small enough to be within arms-length of all equipment. The edges are raised to prevent tiles from sliding off and the surface is covered in felt to limit wear on the tiles. Automatic dealing tables are available, often used for high stakes playing and tournaments, are able to shuffle tiles, build walls, and randomize dice. It is an elaborate device built into a table which uses two alternating sets of tiles. It prepares one wall while the players play one hand. After the hand is finished the tiles are dropped into the table and a new wall raises upwards. In theory the table should avoid cheating (by stacking the deck and or using loaded dice). There are variations that feature specific use of tiles. Some three-player versions remove the North Wind and one Chinese provincial version has no honors. Korean Mahjong removes the bamboo suit or at least its numbers 2–8 so that terminals can be used. Japanese Mahjong rarely uses Flowers or Seasons. The Seasons are removed in Korean Mahjong, while many Southeast Asian sets have more flower series. Some players accept wild cards when playing Mahjong. The wild cards are decided at the beginning of the game. The wild card can be the next tile after spreading tiles to all players or separately decided by a dice toss. Wild cards are not allowed to be discarded and can replace any tiles in Chows. Wildcards cannot replace any tiles in Pongs and Kongs. For example, if a character 4 taken out, then character 4 and the next number 5 can be used as wild cards in this round (When the tile showed, the tiles of the same pattern left only 3, so the next tile in the suit will be used as wild cards as well, adding to 7 wild cards for 4 players). Also, if a tile numbered 9 is chosen, then the number 9 and 1 are wild cards. Top eight are Vietnamese jokers. Bottom four are Chinese. The bonus tiles are not available for wild cards. A feature of several variations of Mahjong, most notably in American mahjong, is the notion of some number of Joker tiles. They may be used as a wild card: a substitute for any tile in a hand, or, in some variations, only tiles in melds. Another variation is that the Joker tile may not be used for melding. Depending on the variation, a player may replace a Joker tile that is part of an exposed meld belonging to any player with the tile it represents. Rules governing discarding Joker tiles also exist; some variations permit the Joker tile to take on the identity of any tile, and others only permit the Joker tile to take on the identity of the previously discarded tile (or the absence of a tile, if it is the first discard). Joker tiles may or may not affect scoring, depending on the variation. Some special hands may require the use of Joker tiles (for example, to represent a "fifth tile" of a certain suited or honor tile). Japanese rule sets discourage the use of Flowers and Seasons. Korean rules and three-player Mahjong in the Korean/Japanese tradition use only Flowers. In Singapore and Malaysia an extra set of bonus tiles of four animals are used. The rule set includes a unique function in that players who get two specific animals get a one-time immediate payout from all players. In Taiwanese Mahjong, getting all eight Flowers and Seasons constitutes an automatic win of the hand and specific payout from all players. These animal tiles are used in Thailand, Malaysia, Singapore and local variations. They represent the cat, mouse, rooster and centipede. Like flower tiles, they also function as bonus tiles. However, as they have no corresponding seat position, any player who draws one of these gets a bonus point. Cubic dealer and prevailing wind marker. Depending on the variation, two or three dice are usually used to decide what part of the wall to start dealing from. They are six-sided dice, traditionally but not necessarily Chinese dice with red one and four pips. The dealer marker is a round or square object that the dealer places to the side to remind players who the dealer is. The wind marker may be used which indicates the current prevailing wind. In some cases the dealer marker and the wind marker are represented by one large marker, usually a small wheel where one can swivel the outer circle to indicate the prevailing wind (which the dealer holds onto), a cube with the four winds placed onto four of the sides which can be placed in a hollow square (the dealer holds onto it), or a cylinder locked into frame which can be rolled to expose the wind on the top. Japanese mahjong, especially in a gambling environment, may optionally use four yakitori markers to indicate which players have not won a hand yet and has to pay a bonus. There are a variety of counting pieces used in different countries. They range from Chinese or Japanese counting sticks (thin sticks with various dots on them to represent various points), jetons, play money, paper and pencil or various apps on touchscreen devices used to calculate and keep scores. In the American variations it is required that, before each hand begins, a Charleston be enacted. In the first exchange, three tiles are passed to the player on one's right; in the next exchange, the tiles are passed to the player opposite, followed by three tiles passed to the left. If all players are in agreement, a second Charleston is performed; however, any player may decide to stop passing after the first Charleston is complete. The Charleston is followed by an optional pass to the player across of one, two, or three tiles. The Charleston, a distinctive feature of American Mahjong, may have been borrowed from card games such as Hearts. Japanese and Korean Mahjong have some special rules. A player cannot win by a discard if that player had already discarded that piece, where players' discards are kept in neat rows in front of them. Players may declare ready, meaning that they need one tile to win, cannot change their hand and win extra points if they win. Some rules may replace some of the number 5 tiles with red tiles, as they can earn more points. Korean Mahjong does not allow melded (stolen) chows. Taiwanese Mahjong adds three tiles to a hand requiring a 5th set to be formed, making a clean hand or all Pong hand very difficult to procure. American Mahjong has distinctive game mechanics and the article on American Mahjong details these. Some differences include many special patterns, a different scoring system and the use of jokers and five-of-a-kind. Many variations have specific hands, some of which are common while some are optional depending on regions and players. One example is the Pure Green hand made of chows or Pongs using 2, 3, 4, 6, 8 of bamboo and green dragon. can be the eyes), the hand is said to be a ready hand, or more figuratively, "on the pot". The player holding a ready hand is said to be waiting for certain tiles. It is common to be waiting for two or three tiles, and some variations award points for a hand that is waiting for one tile. In 13-tile Mahjong, the largest number of tiles for which a player can wait is 13 (the thirteen wonders, or 13 orphans, a nonstandard special hand). Ready hands must be declared in some variations of Mahjong, while other variations prohibit the same. Some variations of Mahjong, most notably Japanese and Korean ones, allow a player to declare rīchi (立直, sometimes known as reach, as it is phonetically similar). A declaration of rīchi is a promise that any tile drawn by the player is immediately discarded unless it constitutes a win. Standard requirements for rīchi are that the hand be closed or have no melds declared (other than a concealed Kong) and that players already have points for declaration of rīchi. A player who declares rīchi and wins usually receives a point bonus for their hand directly, and a player who won with rīchi also has the advantage to open the inner dora (ドラ, from "dra"gon) which leads to higher possibilities to match such a card, thus has more chance to grant additional bonus. However, a player who declares rīchi and loses is usually penalised in some fashion. Declaring a nonexistent rīchi is also penalised in some way. In some variations, a situation in which all four players declare a rīchi is an automatic drawn game, as it reduces the game down to pure luck, i.e., who gets their needed tile first. If only the dead wall remains (or if no dead wall exists and the wall is depleted) and no one has won, the hand is drawn (流局 liú jú, 黃莊 huáng zhuāng, Japanese 流局 ryūkyoku), or "goulashed". A new hand begins, and depending on the variant, the Game Wind may change. For example, in most playing circles in Singapore, if there is at least one Kong when the hand is a draw, the following player of the dealer becomes the next dealer; otherwise, the dealer remains dealer. Japanese Mahjong has a special rule called sanchahō (三家和), which is, if three players claim the same discard in order to win, the hand is drawn. One reason for this is that there are cases in which bars of 1,000 points for declaring rīchi cannot be divided by three. The rule is treated the same as "abortive draws". , but could also go for the nonstandard thirteen wonders hand as well). Four Winds' barrier (四風子連打, Sūfontsu rentā): On the first turn without any meld declarations, if all 4 players discard the same Wind tile, the hand is drawn. Yonin rīchi (四人立直): If all four players declare rīchi, the hand is drawn. Four Kongs' abort (四槓散了, Sūkan sanra): The hand is drawn when the fourth Kong is declared, unless all four Kongs were declared by a single player. Still, the hand is drawn when another player declares a fifth Kong. Scoring in Mahjong involves points, with a monetary value for points agreed upon by players. Although in many variations scoreless hands are possible, many require that hands be of some point value in order to win the hand. While the basic rules are more or less the same throughout Mahjong, the greatest divergence between variations lies in the scoring systems. Like the rules, there is a generalized system of scoring, based on the method of winning and the winning hand, from which Chinese and Japanese base their roots. American Mahjong generally has greatly divergent scoring rules, as well as greatly divergent general rules. Because of the large differences between the various systems of scoring (especially for Chinese variants), groups of players will often agree on particular scoring rules before a game. Points (terminology of which differs from variation to variation) are obtained by matching the winning hand with different criteria scoring different values. The points obtained may be modified into scores for each player using some (typically exponential) functions. Some criteria may be also in terms of both points and score. In many variations the dealer receives no scoring bonus and does not maintain his turn by winning or a dead hand. In classical Mahjong all players score points. Points are given for sets and hand composition and winning bonuses, doubled and redoubled for basic patterns. Sometimes a loser may score more points than a winner. Japanese Mahjong has a complex scoring system with several stages of scoring, rules and exceptions, evening out scores and bonus points at the end of a match. Korean Mahjong has a simple scoring system where only winner scores without any form of doubling. Some variations give points for concealed hands, in which case no melds are made except by winning on a discard. Only the winner scores points. Winning hands are scored by totaling the point value of each element in the hand. Points are distinct from the actual payment received from each player. In order to win, a player needs to have at least the minimum points agreed in advance (often 3). Bonus points are separate from the minimum points a player needs to win. If a player goes Mahjong with a legal and minimum hand, his hand is scored by adding his points and bonus points together. if the player was the dealer or not. A single player game employs the tiles of mahjong, usually played on computers or devices. The game is entirely unrelated to mahjong or its variations and is a recent invention. A two player version was published by Nintendo. The game involves stacking tiles face up in various elaborate patterns and removing uncovered matching tiles at the end of rows. In 1998, in the interest of dissociating illegal gambling from Mahjong, the China State Sports Commission published a new set of rules, now generally referred to as Chinese Official rules or International Tournament rules (see Guobiao Majiang). The principles of the new, wholesome Mahjong are no gambling, no drinking, and no smoking. In international tournaments, players are often grouped in teams to emphasize that Mahjong from now on is considered a sport. The new rules are highly pattern-based. The rulebook contains 81 combinations, based on patterns and scoring elements popular in classic and modern regional Chinese variants; some table practices of Japan have also been adopted. Points for flower tiles (each flower is worth one point) may not be added until the player has scored eight points. The winner of a game receives the score from the player who discards the winning tile, plus eight basic points from each player; in the case of zimo (self-drawn win), he receives the value of this round plus eight points from all players. The new rules were first used in an international tournament in Tokyo, where, in 2002, the first global tournament in Mahjong was organized by the Mahjong Museum, the Japan Mahjong Organizing Committee, and the city council of Ningbo, China. One hundred players participated, mainly from Japan and China, but also from Europe and the United States. 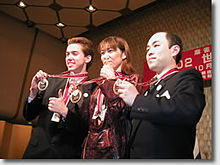 Mai Hatsune, from Japan, became the first world champion. The following year saw the first annual China Mahjong Championship, held in Hainan; the next two annual tournaments were held in Hong Kong and Beijing. Most players were Chinese; players from other nations attended as well. In 2005, the first Open European Mahjong Championship was held in the Netherlands, with 108 players. The competition was won by Masato Chiba from Japan. The second European championship in Copenhagen(2007) was attended by 136 players and won by Danish player Martin Wedel Jacobsen. The first Online European Mahjong Championship was held on the Mahjong Time server in 2007, with 64 players, and the winner was Juliani Leo, from the U.S., and the Best European Player was Gerda van Oorschot, from the Netherlands. The Third Open European Mahjong Championship 2009 at Baden/Vienna, Austria, was won by Japanese player Koji Idota, while runner-up Bo Lang from Switzerland became European Champion. There were 152 participants. In 2006, the World Mahjong Organization (WMO) was founded in Beijing, China, with the cooperation of, amongst others, the Japan Mahjong Organizing Committee (JMOC) and the European Mahjong Association (EMA). This organization held its first World Mahjong Championship in November 2007 in the Chinese town of Chengdu, attended by 144 participants from all over the world. It was won by Li Li, a Chinese student at Tsinghua University. The next World Championship took place in Utrecht, the Netherlands, 27 to 29 August 2010. Other major international tournaments include the Mahjong International League's World Mahjong Sports Games and the privately sponsored World Series Of Mahjong. American mahjong tournaments are held in virtually every state—the largest is in Las Vegas, Nevada twice a year, and in Atlantic City, New Jersey, by Mah Jongg Madness; and the annual cruise hosted by the National Mah Jongg League and Mah Jongg Madness (MJM). MJM tournaments host between 150 and 500 participants at these larger events; and there are several smaller scale, but equally successful tournaments held annually by other hosts. Prize pools are based on the number participating. Rules are based on the National Mah Jongg League standard rules. Mahjong is based on draw-and-discard card games that were popular in 18th and 19th century China, some of which are still popular today. They were played with a stripped deck of money-suited cards. Each deck is divided into three suits of Cash or coins, Strings of cash, and Myriads of strings. There are nine ranks in each suit. In addition, there are three wild cards: Red flower, White flower, and Old thousand. Depending on the game, there are multiple copies of each card. Games scholar David Parlett has written that the Western card games Conquian and Rummy share a common origin with Mahjong. All these games involve players drawing and discarding tiles or cards to make melds. Khanhoo is an early example of such a game. The most likely ancestor to Mahjong was pènghú (碰和) which was played with 120 or 150 cards. During the late 19th century, pènghú was used interchangeably with máquè in both card and tile form. It is not known when the conversion from cards to tiles took place precisely but it most likely occurred in the middle of the 19th century. The earliest surviving tile sets date to around 1870 and were acquired in Fuzhou, Shanghai, and Ningbo. These sets differ from modern ones in several ways. In the Glover sets, there were no "flower" and fā ("green dragon") tiles. In their place were "king" tiles for heaven, earth, man, and harmony and also for each of the 4 "winds" which may have acted as bonus tiles. In the contemporaneous Himly set, there were no zhōng ("red dragon") tiles either. Instead there were the wild cards known as Cash Flower, String Flower, and Myriad Flower plus an additional tile, the king of everything. These early jokers are still found in the Vietnamese and Thai sets. They may have been removed as the tiles share the same titles as the leaders of the Taiping Rebellion (1850–1864). For example, Hong Xiuquan was the self-styled "Heavenly King of Great Peace" and his top subordinates were called east king, south king, west king, and north king. The ban on gambling after the founding of the People's Republic in 1949 led to a decline in playing. The game itself was banned during the Cultural Revolution (1966–1976). Today, it is a favorite pastime in China and other Chinese-speaking communities. In 1895, British sinologist William Henry Wilkinson wrote a paper which mentioned a set of cards known in central China by the name of ma chioh, literally, hemp sparrow, which he maintained was the origin of the term Mahjong. He did not explain the dialect of the originator or region specific etymology of this information. By 1910, there were written accounts in many languages, including French and Japanese. Many variants of Mahjong developed during this period. By the 1930s, many revisions of the rules developed that were substantially different from Babcock's classical version (including some that were considered fundamentals in other variants, such as the notion of a standard hand). The most common form, which eventually became "American Mahjong", was most popular among Jewish women. Standardization came with the formation of the National Mah Jongg League (NMJL) in 1937, along with the first American Mahjong rulebook, Maajh: The American Version of the Ancient Chinese Game, written by NMJL's first president and co-founder, Viola L. Cecil. Many consider the modern American version a Jewish remake, as many American Mahjong players are of Jewish descent. The NMJL was founded by Jewish players and is considered a Jewish organization. In 1986, the National Mah Jongg League conducted their first Mah Jongg Cruise Tournament, in conjunction with Mah Jongg Madness. In 2010, this large scale seagoing event hosted its 25th Silver Anniversary Cruise, with players from all over the States and Canada participating. In 1999, a second organization was formed, the American Mah Jongg Association. The AMJA currently hosts tournaments all across North America, with their signature event being at the Trump Taj Mahal Casino Resort in Atlantic City, New Jersey before it went bankrupt and closed on October 10, 2016. In the United Kingdom, British author Alan D. Millington revived the Chinese classical game of the 1920s with his book The Complete Book of Mah-jongg (1977). This handbook includes a formal rules set for the game. Mahjong culture is still deeply ingrained in the Chinese community. Sam Hui wrote Cantopop songs using Mahjong as their themes, and Hong Kong movies have often included scenes of Mahjong games. Many gambling movies have been filmed in Hong Kong, and a recent subgenre is the Mahjong movie. Prolonged playing of Mahjong may trigger epileptic seizures according to a 2007 study. To date there are 23 reported cases of Mahjong-induced seizures in the English medical literature. Some doctors speculate that this may be due to stress and complex manual movement correlated with intense brain function similar to playing chess or card games such as poker. Mahjong was also adapted into several puzzle video games such as Mahjong Trails, listed as one of the top-grossing games on Facebook. More elaborated superstitions in Mahjong include those found in the game poker, not counting one's wins and losses, to the comical like changing one's undergarments after a loss. As with all superstitions in gaming, none of them have been properly demonstrated as effective though for some the rituals have become an integral part of the game experience and its aesthetics. Sticks Chinese: 索子; pinyin: suǒzi Japanese: 索子; rōmaji: sōzu Originally means bar of 100 pence. traditional Chinese: 餅子; simplified Chinese: 饼子; pinyin: bǐngzi Japanese: 筒子; rōmaji: pinzu Originally meant penny. Myriads traditional Chinese: 萬子; simplified Chinese: 万子; pinyin: wànzi Japanese: 萬子; rōmaji: wanzu or manzu Originally means 10000 pence. Dragons Chinese: 箭牌; pinyin: jiànpái Japanese: 三元牌; rōmaji: sangenpai; "three fundamental"
simplified Chinese: 红中; traditional Chinese: 紅中; pinyin: hóngzhōng; Jyutping: hung4zung1; literally: 'red center' Japanese: 中; rōmaji: chun Started off as a fifth Wind. Chinese: 發財; pinyin: fācái; Jyutping: faat3coi4; literally: 'to get rich' Japanese: 發; rōmaji: hatsu Entered the set by 1890. Chow traditional Chinese: 順子; simplified Chinese: 顺子; pinyin: shùnzi Japanese: 順子; rōmaji: shūntsu or jūntsu Run of three tiles from the same suit. 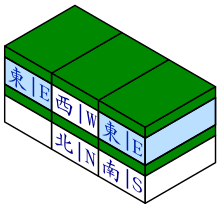 Pong Chinese: 刻子; pinyin: kèzi Japanese: 刻子; rōmaji: kōtsu Three identical tiles, triplet. Kong traditional Chinese: 槓子; simplified Chinese: 杠子; pinyin: gàngzi Japanese: 槓子; rōmaji: kantsu Four identical tiles, quadruplet. Japanese: アガリ; rōmaji: agari Declaring a completed hand. Japanese: 自摸和; rōmaji: tsumoagari Drawing the tile required to complete a legal hand on one's turn. Japanese: テンパイ or 聴牌; rōmaji: tenpai A hand that is one tile away from winning. (Cantonese) Chinese: 詐糊Cantonese Jyutping: zaa3wu4 Japanese: 錯和; rōmaji: chonbo Calling mahjong without a legal hand. short hand Chinese: 小相公; pinyin: xiǎoxiànggōng; Cantonese Jyutping: siu2soeng3gung1 Having too few tiles to win (eg. if a player forgets to draw a tile after declaring a kong). Chinese name literally translates to "small husband". long hand Chinese: 大相公; pinyin: dàxiànggōng; Cantonese Jyutping: daai6soeng3gung1 Having too many tiles to win (eg. if a player draws a tile by mistake after calling a pong from a discard). Chinese name literally translates to "big husband". draw Chinese: 流局; pinyin: liújú; Cantonese Jyutping: lau4guk6 Japanese: 流局; rōmaji: ryūkyoku When no players has won with 14 or fewer tiles left in the wall. Mahjong tiles were added to the Unicode Standard in April, 2008 with the release of version 5.1. ^ "Mahjong Around the World". World Series of Mahjong. ^ Vickroy, Donna. "Growing interest in ancient Chinese game". Daily Southtown. ^ Glasser, AJ (20 July 2011). "Mad Respect for Mahjong on This Week's List of Fastest-Growing Games by DAU". Adweek. ^ "WITH VIDEO: 'Mahjong!' Ancient game enjoys continued popularity". The Courier. ^ Millington, A. D. (1977). The complete book of Mah-Jongg. London: A. Barker. ISBN 0213166224. OCLC 3069655. ^ Shirriff, Ken. "Mah Jongg Tiles and Names". righto.com. Retrieved 24 August 2018. ^ Lo, Amy (2001). The Book of Mahjong: An Illustrated Guide. North Clarendon, VT: Tuttle, p. 6. ISBN 978-0-8048-3302-8. ^ "San Hako Mahjong". San Hako Mahjong. Retrieved 21 February 2018. ^ "National Mahjjong League". Nationalmahjonggleague.org. Retrieved 7 September 2012. ^ The Mahjong Wiki.Three-player mahjong. Retrieved 17 November 2017. ^ Gregory, Peter. "Tile Classification". Mahjongbritishrules.com. Retrieved 7 September 2012. ^ "The Independent Internet Mahjong Newspaper". Mahjongnews.com. Archived from the original on 12 October 2007. Retrieved 7 September 2012. ^ "Martin Wedel Jacobsen European mahjong champion". Mahjongnews.com. 20 June 2007. Retrieved 7 September 2012. ^ "OEMC 2009 Final Ranking". Mahjongnews.com. 5 July 2009. Retrieved 7 September 2012. ^ a b c d e Lo, Andrew (2004). ‘China’s Passion for Pai: Playing Cards, Dominoes, and Mahjong’. In: Asian Games: The Art of Contest. Asia Society. pp. 217–231. ISBN 0-87848-099-4. ^ Parlett, David (1978). The Penguin Book of Card Games. ISBN 978-0-14-103787-5. ^ a b Stanwick, Michael (2004). "'Mahjong(g) Before Mahjong(g): Part 1'". The Playing-Card. 32 (4): 153–162. ^ Sloper, Tom. History of Mahjong FAQ 11. Retrieved 6 November 2015. ^ Stanwick, Michael; Xu, Hongbin (2008). "Flowers and Kings: An Hypothesis of their Function in Early Ma Que". The Playing-Card. 37 (1): 29–40. ^ Sloper, Tom. Is my set complete? at sloperama.com. Retrieved 16 May 2016. ^ Depaulis, Thierry (2007). "'Embarrassing Tiles: Mahjong and the Taipings'". The Playing-Card. 35 (3): 148–152. ^ "Mahjong in China". Win Mahjong. Retrieved 29 December 2014. ^ Wilkinson, W.H. (1895). "Chinese Origin Of Playing Cards". The American Anthropologist. viii: 61–78. doi:10.1525/aa.1895.8.1.02a00070. ^ Heller, Steven (15 March 2010). "Recalling the Craze for a Game of Chance". The New York Times. ^ Bill Bryson, Made in America. Harper, 1996, ch. 16. ^ a b c "Why are so many players of American mah-jongg Jewish?". Sloperama.com. Retrieved 7 September 2012. ^ Tom Sloper, The Red Dragon & The West Wind: The Winning Guide to Official Chinese & American Mah-Jongg, HarperCollins, 2007. ^ Pakarnian, John, "Game Boy: Glossary of Japanese Gambling Games", Metropolis, 22 January 2010, p. 15. ^ Matsutani, Minoru, "Mah-jongg ancient, progressive", Japan Times, 15 June 2010, p. 3. ^ Schodt, Frederik, Manga! Manga! The World of Japanese Comics. Kodansha, 1986, Chapter 5. ^ Richard S.K. Chang; Raymond T.F. Cheung; S.L. Ho & Windsor Mak (2007), "Mah-jong–induced seizures: case reports and review of twenty-three patients" (PDF), Hong Kong Med J, 13 (4): 314–318. ^ England, Vaudine (4 August 2007). "Mahjong game can induce epileptic seizures". BBC News. Retrieved 7 September 2012. ^ "Only one way to cure mahjong epilepsy - avoid the game". South China Morning Post. Retrieved 19 February 2016. ^ Cheng, ST; Chan, AC; Yu, EC (24 May 2012). "An exploratory study of the effect of mahjong on the cognitive functioning of persons with dementia". Int J Geriatr Psychiatry. 21: 611–7. doi:10.1002/gps.1531. PMID 16779765. ^ "Top-grossing". Facebook. Retrieved 8 November 2017. ^ Lam, Desmond. "Chinese Gambling Superstitions and Taboos". ^ Stanwick, Michael (2006). "Mahjong(g), before and after Mahjong(g): Part 2". The Playing-Card. 35 (1): 27–39. Lo, Amy. The Book of Mahjong: An Illustrated Guide. Tuttle Publishing: 2001. Rep, J. (2007). The great mahjong book: History, lore and play. North Clarendon, VT: Tuttle Pub.ISBN 0-8048-3302-8. Oxfeld, Ellen, Blood, Sweat, and Mahjong: Family and Enterprise in an Overseas Chinese Community. Cornell University Press: 1993. ISBN 0-8014-9908-9. Pritchard, David B., Teach Yourself mahjong. McGraw-Hill/Contemporary: 2001. ISBN 0-658-02147-8. Sloper, Tom., Mah-Jongg: Game of the Orient. Self-published: n.d.
Wright Patterson Mah Jongg Group, Mah Jongg; Wright-Patterson Rules. Wright Patterson Mah Jongg Group: 1963. Depaulis, Thierry, ‘Embarrassing Tiles: Mahjong and the Taipings’. In: The Playing-Card, Vol. 35, No. 3, 2007, pp. 148 – 153. Ebashi, Takashi, ‘Proto Mahjong. Mahjong Tiles in the 19th Century’. In: Mahjong Museum Report, Vol. 5, No.2, Issue 9, April 2005, pp. 14 – 17 (in Japanese). Lo, Andrew, ‘China’s Passion for Pai: Playing Cards, Dominoes, and Mahjong’. In: Asian Games: The Art of Contest, Colin Mackenzie and Irving Finkel, eds. Asia Society. 2004. pp. 217–231. Stanwick, Michael, ‘Mahjong(g) Before Mahjong(g): Part 1’. In: The Playing-Card, Vol. 32, No. 4, 2004, pp. 153–162. Stanwick, Michael, ‘Mahjong(g) Before Mahjong(g): Part 2’. In: The Playing-Card, Vol. 32, No. 5, 2004, pp. 206–215. Stanwick, Michael, ‘Mahjong(g), Before and After Mahjong(g): Part 1’. In: The Playing-Card, Vol. 34, No. 4, 2006, pp. 259–268. Stanwick, Michael, ‘Mahjong(g), Before and After Mahjong(g): Part 2’. In: The Playing-Card, Vol. 35, No. 1, 2006, pp. 27–39. Stanwick, Michael and Xu, Hongbing, 'Flowers and Kings: A Hypothesis of their Function in Early Ma Que'. In: The Playing-Card, Vol. 37, No. 1, 2008, pp. 29–40. Stanwick, Michael and Xu, Hongbing, 'From Cards to Tiles: The Origin of Mahjong(g)'s Earliest Suit Names'. In: The Playing-Card, Vol. 41, No. 1, 2012, pp. 52–67. Wilkinson, William H.,(1890): Published in 1901 as pp 184–194 of Catalogue of the Collection of Playing Cards Bequeathed to the Trustees of the British Museum, F. M. O’Donoghue. Wilkinson, William H.,(1893): Published in Culin, Games of the Orient, Tuttle, 1958. First published under the title Korean Games, with Notes on the Corresponding Games of China and Japan, University of Pennsylvania, 1895. Babcock, Joseph Park, Babcock's Rules for Mah-jongg. Mah-jongg Sales Company of America: 1923. Babcock, Smith, Hartman, Work, and Foster, The American Code Of Laws For Mah-Jongg. Standardization Committee: 1924. Millington, A.D., Complete Book of Mah Jong. Weidenfeld & Nicolson: 1993. ISBN 0-297-81340-4. Competition mahjong Official International Rulebook. Takeshobo: 2002. ISBN 4-8124-0944-6. Handbook for the Competitions of the Chinese MaJiang. Organizing Committee of Chinese MaJiang: 2005. Hatsune, Mai and Takunori Kajimoto, translation by Ryan Morris World-Class Mahjong with World Champion Mai Hatsune: 2005. Pritchard, David B., The New mahjong. Right Way: 2004. ISBN 0-7160-2164-1. Wikimedia Commons has media related to mahjong.